Paintings by a previously unknown British artist are expected to fetch more than £100,000 at auction after it was discovered they have works by Francis Bacon on the back. The six previously unseen pieces of work are thought to be part of Bacon's famous Screaming Pope series from the 1950s. Aspiring painter Lewis Todd was given the canvases by his local Cambridge studio to practise on. Todd's family discovered the fragments after this death in 2006 but it is not known how the discarded Bacon paintings were originally acquired by the gallery. 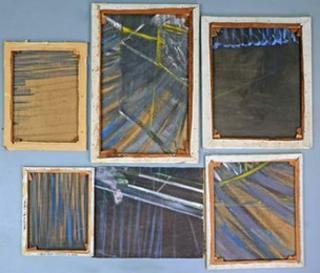 Five of the canvases have been authenticated by the Francis Bacon Authentication Committee and will be sold by Surrey auctioneers Ewbank's on 20 March. "Someone, somewhere might even have a painting by Todd with a pope's head on the back of it," said auction house owner Chris Ewbank. "Anyone who owns a painting by Todd should take it off the wall and check the back of the canvas." Bacon is known to have preferred the unprimed reverse of canvases and often discarded works he was not satisfied with. Samples from the paintings were collected and analysed by Northumbria University. Preliminary results confirm that all pigments and binding medium used were typical of Bacon works. In 2007, Ewbank's sold a group of damaged Bacon paintings found in a skip outside the artist's London studio by electrician Mac Robertson. They were valued at £50,000 but the collection sold for £1.1m. Francis Bacon was born in Dublin in 1909 and worked on the Screaming Pope paintings for about 20 years. Lewis Todd was born in 1925 and was a graphic artist working for the Ministry of Agriculture, Fisheries and Food and as a caricaturist for the Cambridge Daily News.